The Church of England General Synod narrowly voted against approving legislation to allow the ordination of female bishops. A draft measure ushering in the prospect of women bishops cleared the Houses of Bishops and Clergy, but failed to gain the necessary two-thirds majority amongst the Synod's lay members. If just six people had changed their vote from no to yes in the House of Laity, the legislation would have passed. The vote was billed as the biggest the Synod has taken in the 20 years since it first backed the introduction of women priests in 1992. 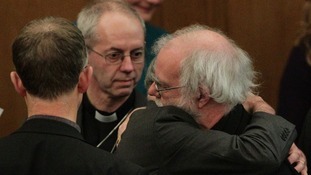 The Archbishop of Canterbury Dr Rowan Williams called the decision "a missed opportunity" and expressed his "deep personal sadness"
Dr Williams, who leaves his role as Archbishop at the end of the year, said after the legislation's defeat, "Of course I hoped and prayed that this particular business would be at another stage before I left". His successor, the Rt Rev Justin Welby, had also fiercely backed the bill. Addressing the Synod earlier in the day, he said he was "deeply committed" to the measure, adding, "It is time to finish the job". Church of England Synod = pathetic. But others hailed the no vote as "very good news" for the Church. Rev Prebendary Rod Thomas, the chairman of the conservative evangelical grouping Reform, said, "We have avoided what could have been a disastrous mistake for our unity and witness". While campaign group Together4ward, which was set up by the Church Society to encourage a no vote, said it was "pleased" the measure had not been passed as they believe it "would not have allowed the Church to go forward together". After announcing the result the Archbishop of York Dr John Sentamu said the measure "will not proceed any further" until a new Synod comes into being - which will be in 2015.